The City of Miami was not quite two years old when a conflict with Spain was brewing to its south on the island of Cuba. Cuba, a colony or province of Spain at the time, was fighting for independence. The United States was supporting the effort. The conflict between Spain and United States escalated on February 15th, 1898, when the USS Maine sunk in the Havana Harbor due to a massive explosion. The ship was sent to Cuba to protect American citizens and interests. Although Spain and the US differed on the cause of the explosion, the event was a catalyst leading to what John Hay, the American Secretary of State at the time, called a “Splendid Little War”. While the war only lasted three months, the initial reaction by the young city of Miami was fear and concern. At the time war was declared on Spain, Miami contained a little more than 1200 residents. The majority of those residents lived in downtown Miami. 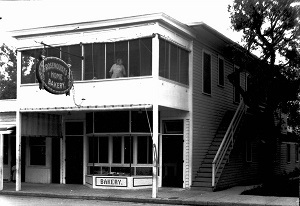 Even prior to the official declaration of war on April 24th, the city’s residents witnessed the arrival of large numbers of people fleeing Key West due to concern of proximity to the conflict. Once war was officially declared, Miami residents feared that Spain would potentially invade Miami as part of an offensive against several coastal cities. Miami offered a sparsely populated area surrounded by shallow waters, therefore was under no real threat as a strategic target for Spain. However, fear trumped logic when it came to safety of the city. The Miami Metropolis, Miami’s lone newspaper, fanned the flames by suggesting that Spanish warships could destroy the Royal Palm Hotel, Miami’s most important building at the time, or some other landmark. The fear of attack by Spain prompted community leaders to petition the Corp of Engineers to provide a fortification to protect the community from an attack by water. The answer to this request was Fort Brickell. On April 5th, 1898, the Brickells agreed to allow for a temporary battery to be constructed on their property. 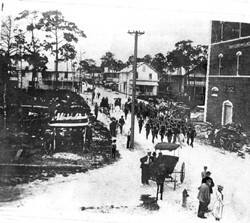 The fortification was constructed just east of today’s Brickell Avenue and Eighteenth Road. 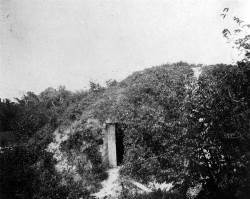 The army erected a bunker forty-five feet in diameter and twenty feet in height on a ridge facing Biscayne Bay. Although originally planned to have four guns, the battery was armed with only two guns. The two heavy guns were mounted outside the fortification. 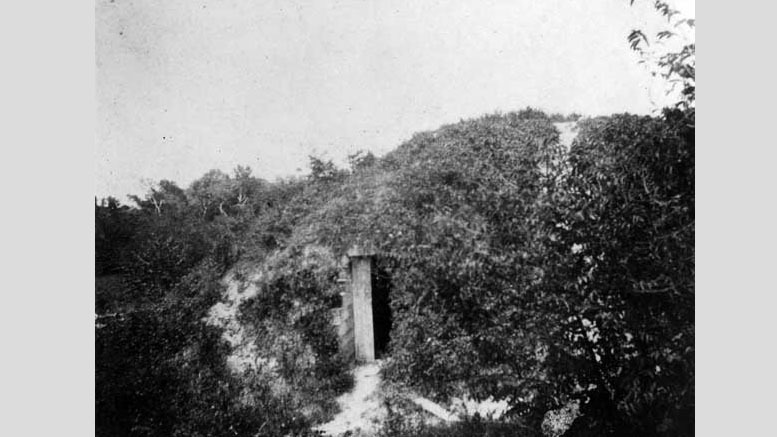 Behind the guns was the earth mound, or bunker, which encased a wooden room in the center to house the magazine. The guns were positioned to face the “dog leg” in the ship channel dredged only one year earlier by Henry Flagler’s shipping company. The channel ran from Cape Florida to the mouth of the Miami River. The “dog leg” referred to the sharp turn in the channel as it approaches the mouth of the Miami River. Ironically, the channel was only dredged to twelve feet and was not deep enough for the types of ships that the fort was erected to protect. The fort was officially named Fort Robert W. Davis for a member of the Florida House of Representatives who was instrumental in securing a military camp in Miami. However, it was known as Fort Brickell by everyone in the community. The fort would have been staffed by the Miami Minutemen. This group of 200 volunteers from the community would march and drill on the grounds of Henry Flagler’s Royal Palm Hotel. However, prior to completely finishing the fort and needing the services of the minutemen, the very brief war had ended. Henry Flagler decided that the war provided an opportunity to showcase the young city and would be a perfect location for a camp to train soldiers for the war. While trying to convince his friends in Washington to deploy troops to train in his new city, he pointed out that the government was already constructing a fort in Miami as part of the war effort. On June 24th, 7000 troops were deployed to Camp Miami for training. Although disarmed shortly after the conclusion of the war, remnants of Fort Brickell remained for many years. It is unclear if it were every formally dismantled or just blended in with the landscape over time. 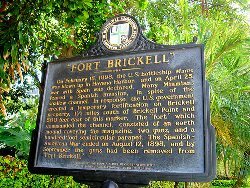 The only evidence of the existence of Fort Brickell is a historic marker found just east of where the fort resided, on Brickell Avenue and Eighteenth Road, describing the fort and its timeline. In duration, size and significance, the fort to protect Miami from an unlikely threat was much like the war. It was both splendid and little. 1 Comment on "A Splendid Little Fort in Miami (1898)"
This is the first time I’ve heard about Fort Brickell. Thanks for the post and information, I live down the street from 18th and Brickell so i will have to go sometime.